We frequently hear the term “servant leader” used to describe an ideally “enlightened” manager or executive. People who instinctively welcome the idea of servant leadership often see it as a sort of inverted management pyramid, with executives supporting the rest of the organization. Those who don’t may envision an overly idealistic or even paternalistic leader who is ineffectual and not grounded in the hard realities of running a business. What does it mean to be a servant leader, and how does it apply to lean leadership? We explored some background on the term, and spoke with two lean leaders who shared their take on the concept, behaviors, and benefits of servant leadership. 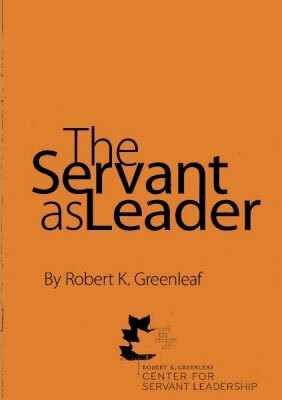 The term was coined by Robert Greenleaf in his 1970 essay The Servant Leader. Greenleaf worked at AT&T for almost 40 years starting in 1926, and was their director of management development. As a corporate businessman, his personal mission was to influence and improve the way large institutions serve both the individuals who work for them and society at large. His main idea was fundamentally this: “The organization exists for the person as much as the person exists for the organization.” He retired in 1964 to form a nonprofit, The Center for Applied Ethics (now the Greenleaf Center). It begins with the natural feeling that one wants to serve, to serve first. Then conscious choice brings one to aspire to lead. That person is sharply different from one who is leader first…. The difference manifests itself in the care taken by the servant-first to make sure that other people’s highest priority needs are being served. The best test, and difficult to administer, is: Do those served grow as persons? Rather than hoarding and concentrating power, the servant-leader works to share power, and to help others develop and perform to their potential. To learn how two expert lean leaders interpret servant leadership, we spoke with David Mann, author of Creating a Lean Culture: Tools to Sustain Lean Conversions, who has observed, researched, worked with, and counseled lean managers for many years, and Mark Schilling, who has “walked the talk” as a lean leader in different companies over 20-plus years. Can you do what we’re asking? Starting with the basic level of a direct supervisor, it has to do with making sure that people know what they’re supposed to do, that they know how to do what they’re supposed to do, and that they have what they need to do their work—the appropriate information, tools, and materials, and equipment that’s operating effectively. When they have problems, they also need to have access to someone who will listen to them, and will take action to help resolve those problems when they interrupt or frustrate them in doing the work they’re supposed to do. As a rule of thumb, an effective supervisor also knows something about every person they work with, talks with every person every day, and expresses some level of personal interest in them. That all goes to the issue of trust: ‘Do you know me, do you care about me, and can I trust you? Simply exhorting people to be better leaders, or lean leaders, or servant leaders is not helpful. You’ve got to set clear expectations for behaviors, and translate broad concepts into practices and tools. Only then will people understand what they’re supposed to be doing, and, as Mann pointed out, without those operational nuts and bolts, you don’t have a leadership proposition that can be tested and verified as effective. Q. How can I improve the effectiveness of my lean initiatives? Think about improving beyond the narrow spectrum of just doing kaizen events. Put in place a mechanism for effectively training everyone who needs to be able to follow the new lean practices. Have supervisors and value-adders collaborate to support daily bottom-up improvement. Senior consultant Jim Vatalaro elaborates on these critical sustainment issues in a podcast on The American Innovator. For the full interview visit our podcasts page and sign in when you click on Lean Deployment and Sustainment. The unimpeachable problem statement points directly to the art of concise communication.